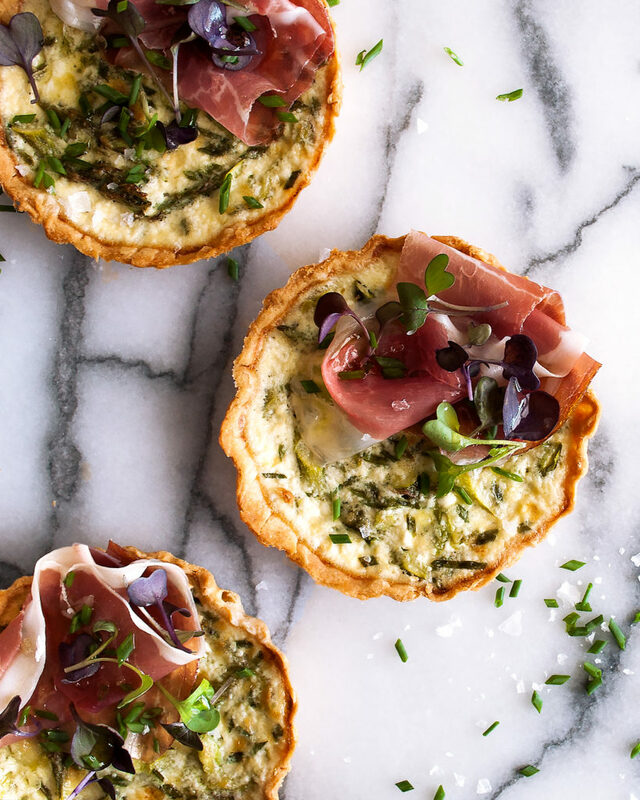 I have the perfect early summer entertaining appetizer for you: these asparagus ricotta tarts with prosciutto & herbs. They are easy to make (don’t be intimidated by the homemade tart dough), light and decadent at the same time, and a super fun way to start a dinner party. Asparagus season will soon come to a close, but you’ll still find plenty of bright green stalks at the farmer’s markets around here in early June. 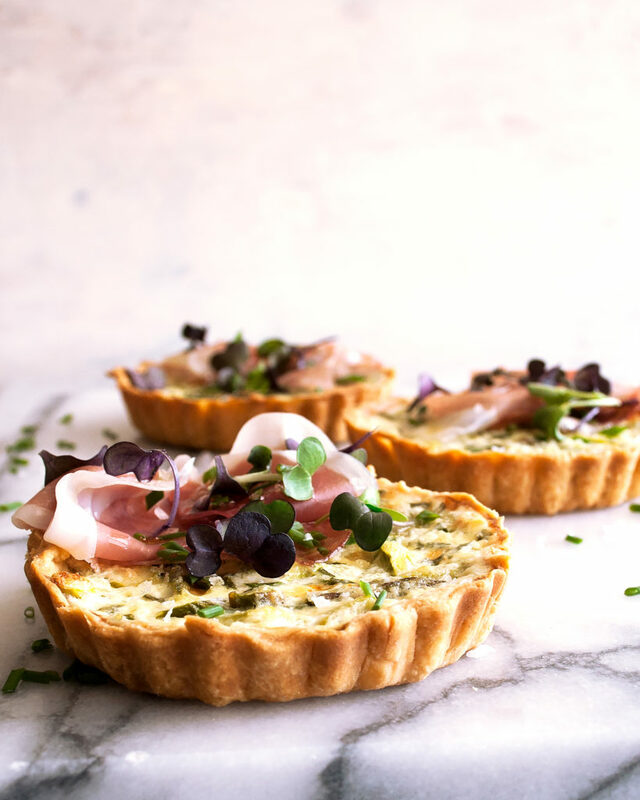 So, I’m savoring the season while it lasts, and using asparagus in these rustic asparagus ricotta tarts! 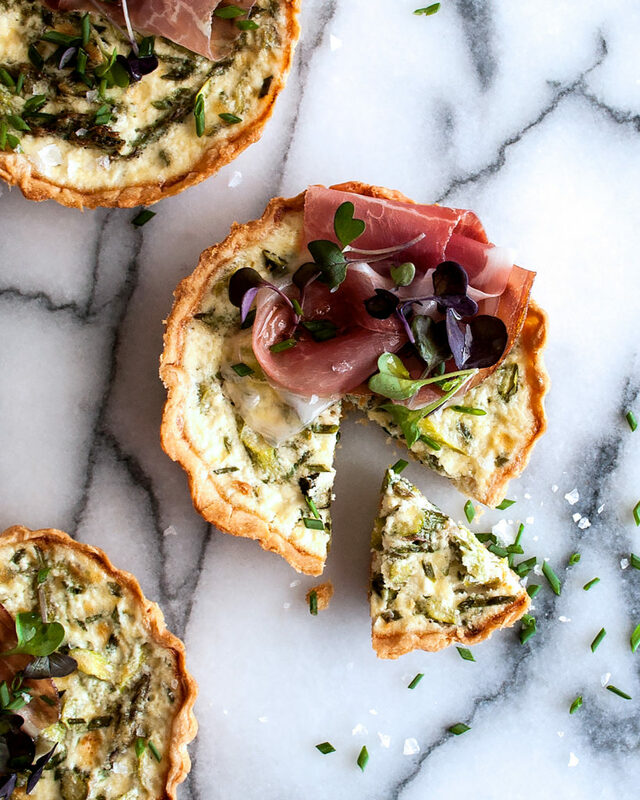 These tarts are bursting with flavor because of the fresh herbs and flaky sea salt. 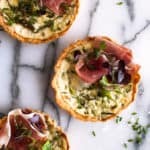 I also top these with a bit of thinly sliced prosciutto to add a layer of richness and another salty bite. The filling comes together really quickly, and while you may be nervous about making the tart dough by hand, it’s pretty much one of the easiest doughs you could make. Just four simple ingredients and a food processor… that’s all you need. 1. Use a scale to weigh everything. I am a huge advocate of baking by weight. So, buy a small kitchen scale and start weighing. It’s the best way to ensure you are getting extremely accurate measurements, which is pretty crucial for most baking recipes. 2. Ensure that the butter is ice cold and cut into small cubes. Before I do anything else, I usually cut the butter, toss it into a bowl, and place it in the freezer. Butter softens quickly with exposure to heat from your hands, so I like to ensure it’s really cold with just a few minutes in the freezer. 3. Same as the butter, you’ll want to use ice cold water. I’ll actually put some ice into a glass, pour filtered water over top, let it hang out for a minute or so, and then measure the water by weight from there. 4. After combining the flour and salt, pulse in the cold butter until it resembles course, “pea-size” crumbs. The butter is what gives the crust it’s flakiness. 5. After adding the cold water to allow the dough to come together, do not over mix it. You want there to still be small “chunks” of butter running throughout the dough. If you overmix, the dough will overheat and the butter will melt, ruining the texture of the dough. After the dough is made and chilled, it essentially gets rolled out and formed into a mini fluted tart pan. Once the tart shells are filled, a process known as “bling baking” is used. 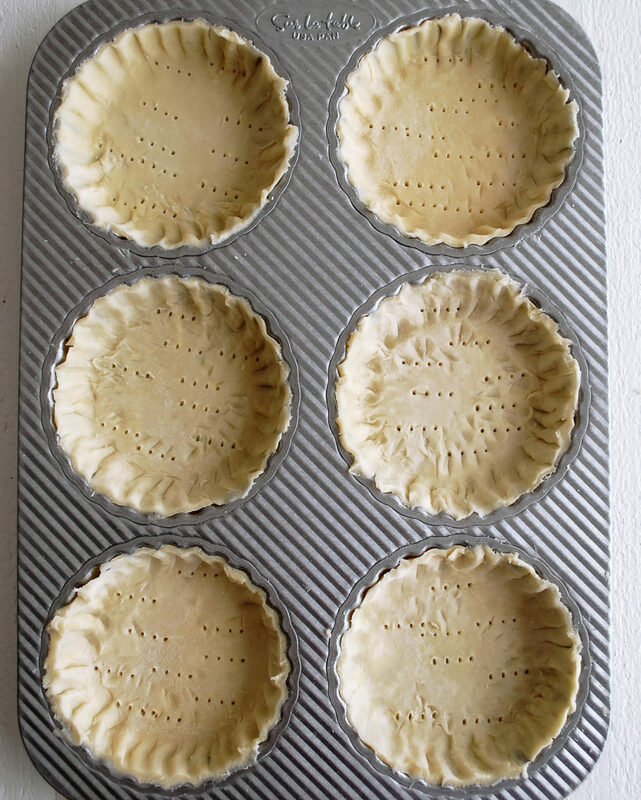 This means the tart shells get pre-baked before the filling is added. You’ll see I use dry beans to hold down the dough as it blind bakes. If you don’t do this, the dough will puff and be pretty impossible to fill. From there, it’s a simple fill, bake, and EAT kind of process. 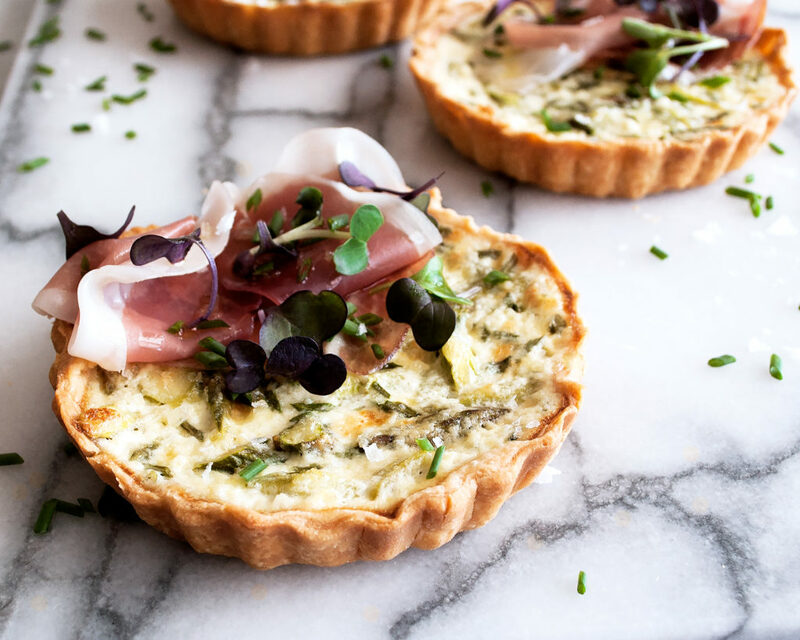 I hope you absolutely love these asparagus ricotta tarts! They can be made ahead of time and warmed up when ready to serve, so I’d say they are pretty much as perfect as it gets for an entertaining recipe. PS…here’s another tart for summer that is equally as good! Summer squash + truffle oil. YES. Combine the flour and salt in a food processor and pulse until incorporated. Add the cold butter and process until the mixture resembles coarse crumbs. Slowly drizzle in the cold water, with the processor running. The dough should begin to pull away from the sides as it forms. Turn the dough out onto a lightly floured surface and shape the dough into a ball. Wrap the dough with plastic wrap and refrigerate for at least 1 hour. Preheat the oven to 375F. Lightly grease the shells of a 6-count mini fluted tart pan with a neutral oil. After an hour of chilling, let the dough sit at room temperature for about 10 minutes to soften slightly. Roll the dough out so that it’s about 1/8” thick. Cut the dough into circles large enough to fit in the tart pan shells. Drop the dough into each shell and work it up the edges, using your fingers to crimp the dough into the fluted sides. Trim off the excess dough around each circle and reserve for another use (it freezes well). Use a fork to prick small holes along the bottom of the dough, about 1 inch apart. Line the inside of the dough with pieces of parchment paper. 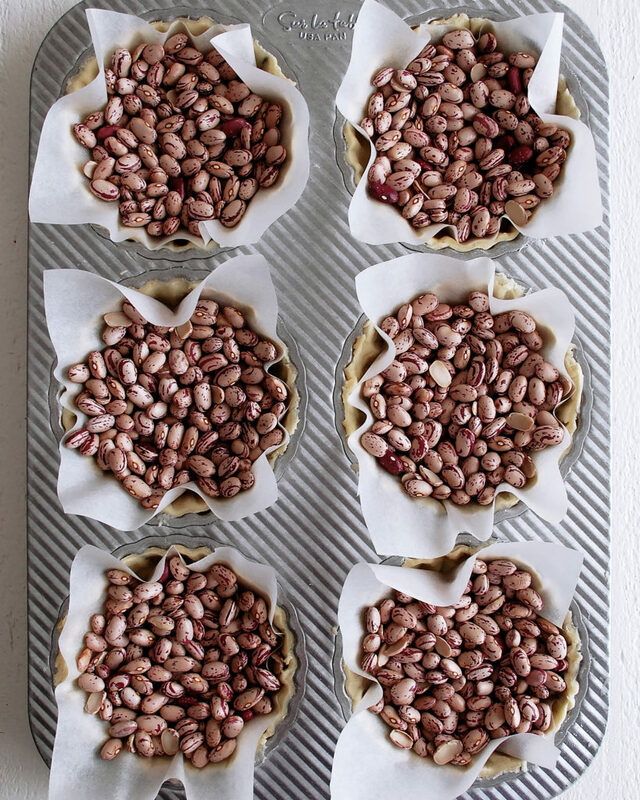 Fill the shells with pie weights (dried beans, rice, or popcorn kernels all work well). Par-bake the dough for 10 minutes. Remove the parchment paper and pie weights. Set the crust aside as you make the filling. Whisk the eggs in a large mixing bowl. Mix in the ricotta cheese and mascarpone until smooth. Add the whole milk, salt, a generous amount of freshly cracked black pepper, chives, and tarragon. Whisk well until combined. Lower the heat of the oven to 350F. 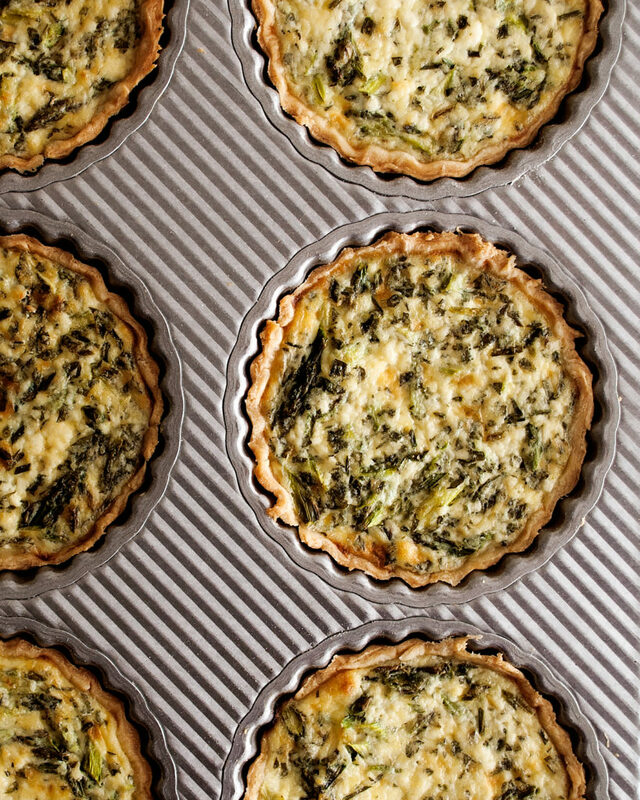 Distribute the sliced asparagus evenly into the bottoms of the tart shells. 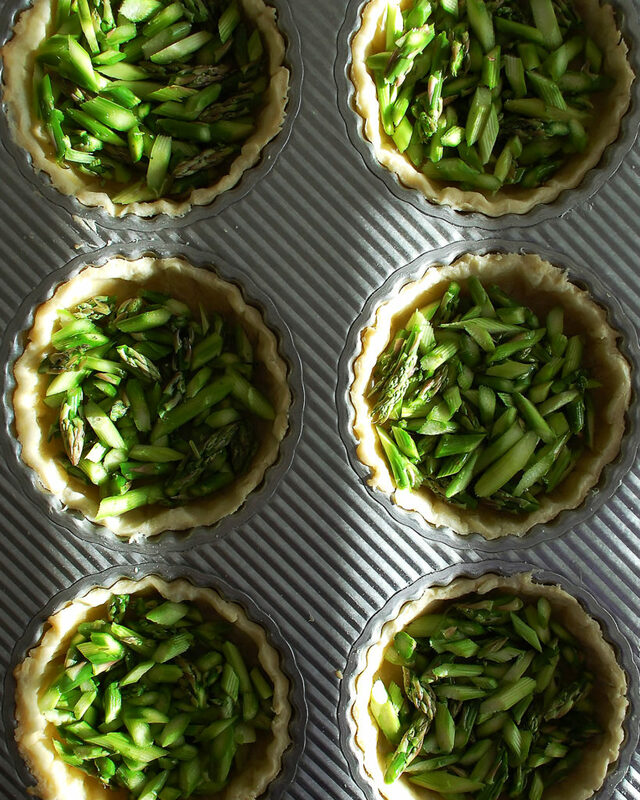 Pour the ricotta mixture over the asparagus to fill the tart shells almost all the way to the top. Bake the tarts for 30 minutes until set. Remove the pan from the oven and let the tarts cool slightly. Gently remove the tarts from the pan using a fork to wiggle them out. Top with the prosciutto, microgreens, fresh chives, a pinch of flaky sea salt, and a drizzle of extra virgin olive oil right before serving.